Working in a corrections environment can seem intimidating. However security is our business, so we’ve built one of the safest environments to practice Medicine in. 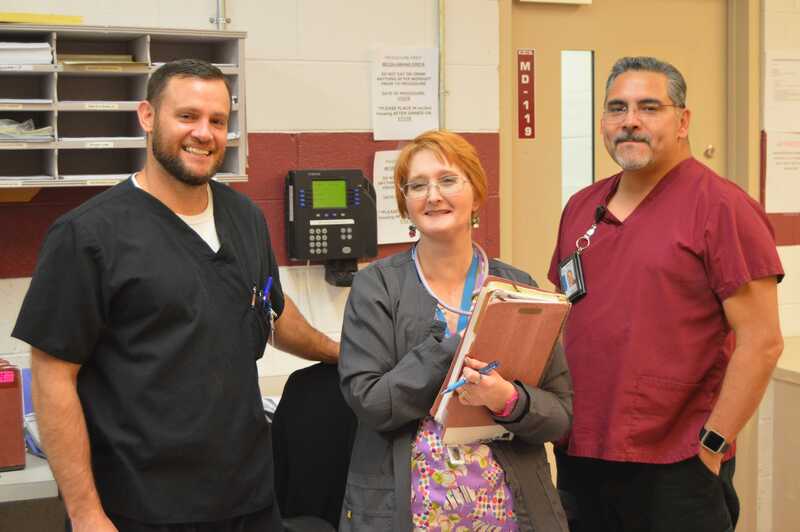 Many of our Nurse and Mental Health care staff say they feel more secure in a CoreCivic facility than where they previously worked. Beyond security, our facilities are bright, clean, well-organized, and come with onsite pharmacy and other ancillary services. We constantly hold ourselves to the highest standards of medicine. Your nursing or mental health care career will benefit from our high standards. Healthcare staff is always initially trained with the most up to date techniques and best practices. And that education and training continue throughout your career. CoreCivic health staff participates in annual conferences, training sessions as well as certification courses. A career you can grow in. Dynamic experiences. Doing the work that matters to you. If this sounds like your kind of Nursing career, then you’re ready to work with us. Less Stress, More Care: That’s our philosophy when it comes to healthcare provider careers with CoreCivic. And working as a Doctor, Dentist or Psychiatrist health care professional is no exception. Unlike traditional healthcare systems, in Correctional Health Services acute care is rare and short term. Routine tasks are eliminated and there is little to no on-call time. All of this adds up to a place where you can focus on what brought you to health care in the first place: helping patients get the best care.